Maze of Bones - 2008 publication. 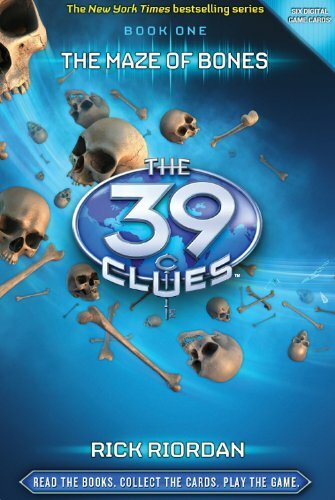 The first book in this groundbreaking multimedia series sends readers around the world on the hunt for the 39 Clues. Written by #1 NYT bestseller Rick Riordan, and backed by $100,000 in prizes!Minutes before she died Grace Cahill changed her will, leaving her decendants an impossible decision: "You have a choice - one million dollars or a clue. "Grace is the last matriarch of the Cahills, the world's most powerful family. Everyone from Napoleon to Houdini is related to the Cahills, yet the source of the family power is lost. 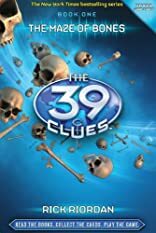 39 Clues hidden around the world will reveal the family's secret, but no one has been able to assemble them. Now the clues race is on, and young Amy and Dan must decide what's important: hunting clues or uncovering what REALLY happened to their parents. 6/17/2009 Kate Lacy said: I'm into the fourth book now, different authors--and I think I'm becoming an adventure junky!! They're so clever and move so fast!! If you are writing for younger MG or ESOL students, check these out!